A late Che Adams penalty put the seal on a Birmingham victory which saw them leapfrog Forest in the table. Nobody got this spot-on, though 9 did have the outcome. Middlesbrough came from behind to beat West Brom as Tony Pulis' first visit to The Hawthorns since he was sacked by the Baggies ended in victory. Nobody had this spot-on, and just Stupid_Gooner got the outcome. Norwich produced a superb away performance to beat Leeds and leapfrog their opponents to go top of the Championship. Again no 3 pointer for anybody, but 8 did have the outcome. There were 10 who predicted a 2-1 win for Leeds, in what was the weeks most predicted score. Ched Evans scored the only goal of the game as Fleetwood beat 10-man Charlton. Well done to noah4x4 for being the only one to have this spot-on, and 3 more got the outcome. Jordan Cook scored twice as Grimsby moved above Newport in League Two with a deserved victory at Blundell Park. Nobody got this spot-on, though 13 did have the outcome. Wow what an incredible week this was, with only the one 3 pointer being achieved, and just 34 outcomes, making it by far the worst week of the season so far, even allowing for one game being called off. On such a low scoring week one performance stood out. That of course came from noah4x4 who as well as being the only one to get a 3 pointer, was also one of the four members to get three outcomes, and he is the weeks top scorer with a decent 6 points. In the Premier It is game on again for the title as that outstanding performance from noah4x4 has reduced the sevebalo lead to just 4 points. A useful three outcomes for mfb_cufc moves him up a couple places. It was three outcomes also for burnsieespana that moved him out of the relegation zone again. In Division One Just one outcome for Sector4, but it was enough for him to increase his lead with his nearest pursuers both firing blanks. 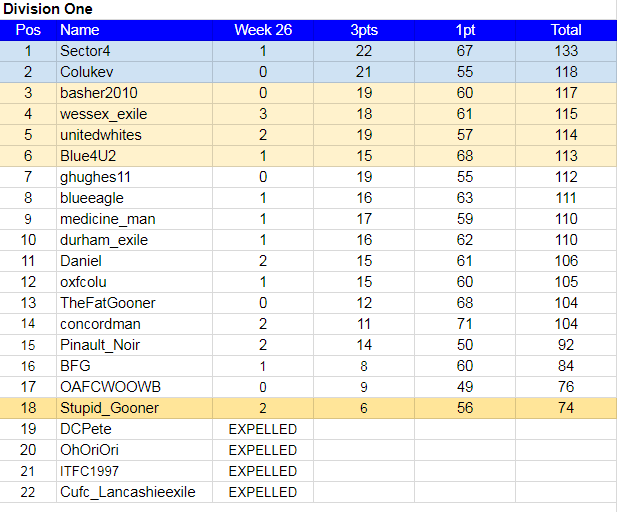 By being the top scorer in this league as the other member to get three outcomes, wessex_exile moves up another couple of places, and has an automatic spot now firmly in his sight. Even though he dropped a place unitedwhites is closer to an automatic spot than he has been all season. A single outcome for Blue4U2 was enough to move him back into the final play-off spot. After failing to post for the fourth week running DCPete becomes the fourth member to be expelled from this league. A third no show in-a-row from OAFCWOOWB means he is now one week from being expelled as well. As I have said in the past it is not something I like doing, and anybody expelled are more than welcome to join again next season, but I would rather people just tell me they don't want be involved anymore, as I wont be offended. Week 27 Fixtures This is now a 7 game week to make up for the postponed game in Week 26. Some fixtures we can all be United with. 1-0 home teams please. Unless I get a chance to edit.